Originally uploaded by ~ .Saad. ~. 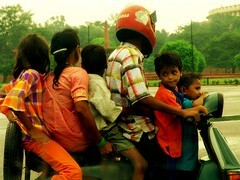 "Yup, that's right.. this here is 6 people on a scooter. Right in front on the parliament, which has the maximum number of cops... Three times the maximum number of people allowed on 2 wheelers.. I count ONE helmet. " Six people on a scooter! Check out the spare tire on the back.